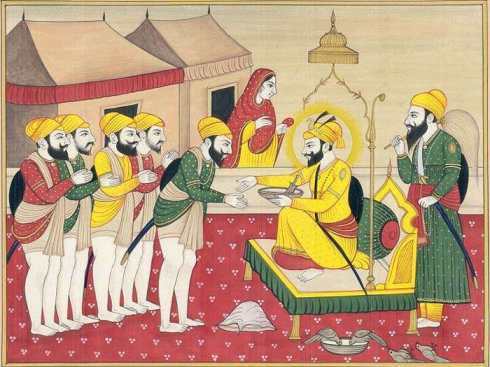 Bhai Nand Lal Ji as always brought Guru Gobind Singh Ji langar, prepared with their own hands… Guru Sahib would sit and enjoy this food daily, Bhai Nand Lal Ji noticed that Guru Sahib would always leave a tiny morsel of their food, only enough for one bite. They would then open the nearby window, where a small dog would bark for food. Guru Sahib would throw the dog this tiny burki of food. Guru Sahib, the knower of all smiled. The following day, before bringing Guru Ji langar, Bhai Nand Lal Ji took the dog home. At his abode, he fed the dog the richest of foods, he fed him til his stomach could take no more. Content that the Dog was full, Bhai Nand Lal Ji returned the dog outside the window of Guru Sahib. He then returned home and prepared Langar for Guru Sahib. That day, Guru Sahib enjoyed the langar to the full, as they ate, Bhai Nand Lal Ji took up their position, beside the dog outside the window – thinking, this was his chance. He too, could possibly have the luck of this dog, and taste that tiny morsel that had also touched the lips of the tenth Human form of Vaheguru. As Bhai Nand Lal Ji sat awaiting paitentlly, Guru Sahib continued to enjoy their food. Eventually, Bhai Nand Lal Ji’s wait came to an end as Guru Ji opened the window on time. Bhai Nand Lal Ji looked up, still hiding behind the dog and watched, waiting to be fed like a King with this tiny bite from Guru Sahib’s own food. Bhai Nand Lal Ji’s eyes filled with tears… as his heart broke into a million pieces… he stood up from beside the dog and with tear filled eyes asked Guru Sahib, “Guru Ji, that bad am I that this dog has better karam then me – every day I’ve watched you save even the smallest bite for him, yet this one day, my destiny is such that you cannot offer me the same treatment” Bhai Nand Lal Ji was almost inconsolable, til Guru Sahib pulled him towards them, and held him close. Bhai Nand Lal Ji’s love for Guru Sahib was worth learning and sharing with others!